The acorn (or oak nut), is the nut of the oak trees (Quercus) in the family Fagaceae. One acorn contains one seed (rarely two) and is inside a very tough shell. Acorns typically take anywhere between 6 and 24 months (depending on the oak species) to mature. A vast amount of wildlife consider acorns essential to their diet; several birds and small mammals such as mice, squirrel and other rodents eat acorns. Bears, wild pigs, mountain sheep, elk, and deer are also known to eat these nutritious nuts as well as humans. There are over 600 species of oak worldwide of which about 85 are in Canada and the US. Oaks thrive at various elevations and in a variety of different soil types. They are native in the northern hemisphere. All acorns are edible; some are sweeter than others. Leaching acorn meat (removed from the shells) is a must before consuming them and boiling is the best way to leach them. Bring them to a boil, change the water and boil once more. After they are leached, a tasty roasted nut can be made by additionally boiling them in heavy salt brine for 15 minutes. Remove from the brine, dry them on a clean towel or napkins and then roll them until they are crisp in a frying pan containing about ¼ inch of hot safflower or sunflower oil. Whole processed acorn meats also can be pickled by covering them with hot white vinegar and pickling spices. Stored two months in a jar (in a dark, cool location) makes them very tasty. White oak acorns have been roasted and ground into a coffee-like beverage. The possibilities for these plentiful nuts are almost endless. Acorns have a degree of bitterness in acorns that’s caused by the amount of tannin in the meat of the nut; tannin is soluble in water. Once you have separated a good amount of acorn meat from the shells, washing out the tannin is next. As mentioned above, you need to leach the nuts first. Once leached they will need to be set aside until dried thoroughly. When the acorns are dried grind them using a Vita Mixer or a coffee bean grinder. You will have good brown flour that can be used for most cooking and baking. Acorn bread is made by mixing 4 cups of acorn flour with 3 tablespoons of butter, 2/3 cup of organic cane sugar, 3 teaspoons of baking powder, 1-1/3 teaspoon of salt, two eggs and 2 cups of milk. Mix all the ingredients in a large pan, beat well and spoon into slightly greased bread pans. Bake at 350 degrees Fahrenheit for 20 minutes. Pancakes are made by adding 1 teaspoon of baking powder, a dash of salt and one egg to one cup of acorn flour. Add milk until this mixture pours well and bake in a slightly greased frying pan. Acorn cake is made by mixing 1 cup of wheat flour and 1 cup of acorn flour with 1/2 cup butter. Beat this together and then add 1 cup organic cane sugar, three eggs and 1 cup milk. Mix very well and bake at 350 degrees Fahrenheit for 45 minutes. Acorns can be stored for winter use. Store the nuts in tight-lid glass jars outside in an unheated garage or shed and used them about January. First Nation’s people buried acorns in mud in the autumn and they stored well for use the following spring. If acorns are stored for long periods where it is warm, many of the shells will be pierced by a tiny hole which is caused by insects. Hollow acorns will bob to the top of a container of water while healthy acorns sink so it’s easy to sort good acorns from bad. The animals haven’t taken all the acorns so get on out there and start collecting! You’re in for a great tasty treat no matter how you use them! I’ve got some red oak acorns ready for processing, and may experiment with clay as a tannin-reducing agent. Do you harvest enough for a whole year, or just through the winter season? Done! You will get a newsletter within a week! Hello I have an oak tree and I wanted to ask when is the best time to collect the acorns. Can you use the ones that fall from the tree that are not cracked open? Depending on where you live will determine when they are ripe for the picking. If you let me know where you are I can help you out! 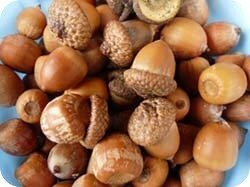 I harvest the white oak acorns and make a Acorn vinegar, pickled acorns,acorn shrub and tincture. I am also using the tannins for a natural dye. check out my new web site which should be on line soon. http://www.crosbyforgeandfarm.com. I have tried many times to get the tannin’s out of my white acorns and was unsuccessful. I have watched many videos and read many blogs. You are the first to mention using salt. I can’t wait to try it again because I purchased some acorn flower and made brownies once and they were the most amazing brownies. It made me decide to learn to make acorn flour myself.